Used to work great, now it won't even start to down load the issue. It just shuts down. Today is the 9th. Still won't work. Please fix I miss reading the Enquirer. I just tried to install the older version and it still won't work, so I uninstalled the app and tried again, said it would install older version, but it still does not work. How can I Get A REFUND. I stupidly prepaid for a full year but I rather buy the magazine at the store than put up with this frustration every week. No phone numbers or customer service. Just keep waiting and waiting. I have always had a subscription with you and now every single week my issue doesn't download. I will be turning off renewal if this isn't resolved!! I was surprised by the look of the magazine and stories in this app. Very impressed. great entertainment. I paid $99 for a year subscription. The app now wants to be paid to download the current issue or any past issues. This company has a dubious history with past offerings. I have a subscription to the Enquirer, have had it for 4 years, why can't I see these on my iPad for free? Or they should have a password or something for people who have the subscription. I have emailed them, explained the prob and they say it is working fine...NOT!!!! What a surprise to find such a huge upgrade in readability. Please return to the periodical style option. This site is now just like ant other free website, except we are paying for it. The fun of reading the Enquirer was flipping thru the pages, jumping among articles and seeing the pictures, not this sterile website that is so boring! Not sure about others, but for me - I really enjoyed the previous, more magazine-like Version; I just don't like the layout, now it's just like reading any other website....which I can do for free.....giving it a few more issues before I cancel in the hopes that other readers feel the same way & format reverts back.....otherwise, I'm OUT!! Never get enough of the National Enquirer!!! Great headlines and deep stories. I love the social features, I can cut out my favorite celeb photos and save them. So many back issues too! One of my favorite subscriptions. I just love it! The design, the sharing everything is so neat and awesome! Would recommend it highly! 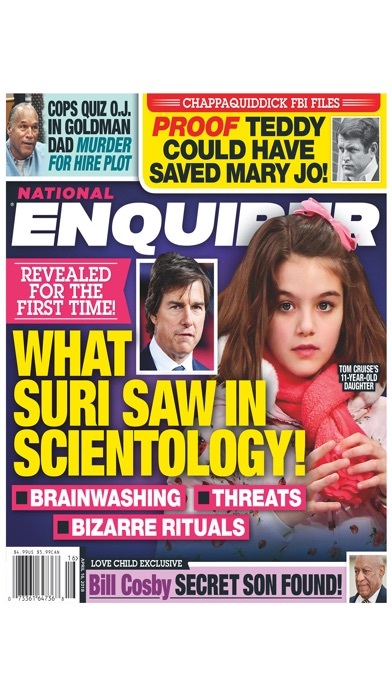 Just like a few others that have posted here so far, I had a yearly subscription to Enquirer Plus and about 10 issues in they stopped publishing it. The notification said to contact Apple to get a refund. So far I have been denied a refund 3 times when I tried contacting Enquirer I got the auto generated "someone will contact you" reply over a week ago and nothing. If they decide they are not making enough off of this version they will probably stop producing it and you can kiss your purchase goodbye! I am entertained by the National Enquirer, but this app is among the worst available anywhere. Starting 3 weeks or so ago, it began (assuming an app can ask) asking me to buy each weeks's issue, although I paid for a year. The app quits unexpectedly. I have had to delete it and reinstall it 3 times today. Deleted and installed again--4th or 5th or 6th time. This Enquiring Mind wonders if anyone in customer or technical support is reading these reviews. I had the first app too, $30. They shut it down, no refund! 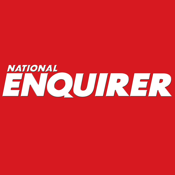 I also had a subscription to Enquirer Plus and got an update letting me know the app was going to be discontinued in favor of a digital version of the print magazine. This is exactly what I want, thank you! Can't get enough of my celebrity news! Such a great app, fun to read and easy to use! Constantly have to reinstall to view issues already down loaded. Will be canceling subscription. So far it's ok. I have read previous reviews and was skeptical, however I am home sick and desperately need to occupied my time, so I took a chance. No problems so far. Will update later should a problem arise. 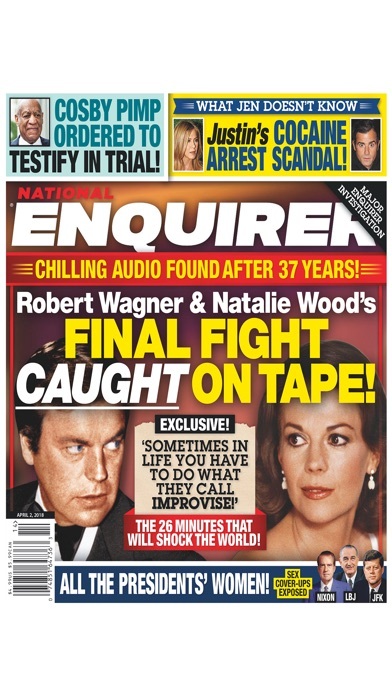 Having grown up with the National Enquirer, I loved the idea of an iPad app. Only recently have I started having problems. I believe there needs to be a function allowing the subscriber to DELETE previous editions. Having them all appear to be again downloaded takes up RAM that is getting precious. Once read, I'd just love to DELETE them!! Thanks, National Enquirer and keep up the great work!! I've been a huge fan of the National Enquirer for years, but I never liked the iPad app, until now. This is so great to read it like this. I like having everything in one place. Plus I’m really embarrassed when I buy this in the store, so now I get it on my iPad and no one has to know about it. I'm so happy I no longer have to go to the supermarket to pick up my copy each week (and my impulse-buy gallon of ice cream). I'm going to lose 10 lbs. now and get the most-accurate reporting out there on my phone! So excited to finally be able to read the National Enquirer that I have loved for years. Mike Walker, the latest gossip, I am in Love! I already prepaid for a year subscription. You cancel the app and keep the money and launch a new app. If there's a class action lawyer reading this you have a case. This is fraud. the actual magazine isn'tAny different from the print version, but the tweeting and Facebook features are so cool. 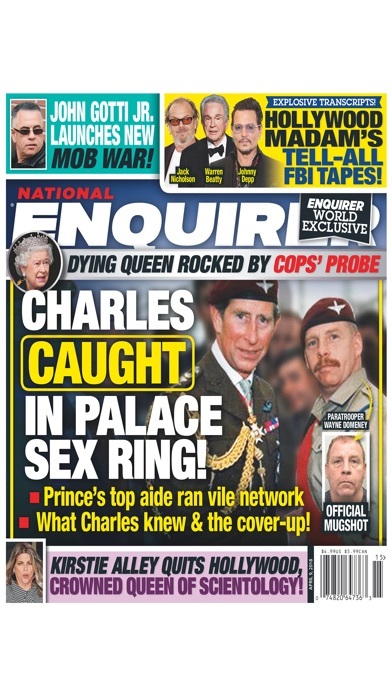 i recommend it to everyone who likes national enquirer! I have a digital subscription and cannot access the current issue. Last week I didn't have the most recent issue. Emailed customer service and got no response. I am going to cancel and never subscribe to this publication again. Poor customer service! Deserves no stars! Really enjoying the new look and feel…. good stuff! I had Enquirer Plus for about $30 and after a few months, the app didn't work and they discontinued it. I tried getting a refund from Apple and they keep saying the enquirer needs to refund...I have tried contacting them (not easy) but nothing!! You would think i would have been contacted by them when their first app was deleted but nothing! Be careful spending $99 on them. They can obviously just delete the app and leave you out whatever balance you have left on a subscription. So dishonest!!! Heed the warnings! Paid subscriptions don't work! Monthly or yearly subscriptions still don't work. They ask for $3.99 for each issue. Go online and see all of the users having this problem. Stay away from this app. I tried to buy a couple of back issues, but couldn't. The app allows you to buy a single issue only if it's the latest issue apparently; to purchase a back issue it prompts you to purchase either a one-year or monthly subscription. Finally , I decided what the heck and signed for a one-month subscription. When I went back to purchase the back issue I wanted, I was again prompted to purchase a one-year or monthly subscription. FIX YOUR APP!!! I love the enquirer, always have, but this app is awful! I downloaded the latest issue to only get a gray screen to look at :(. The smartest thing is to stay away! Buyer beware! I had subscribed to the Enquirer Plus and almost lost my $30.00 because of you people canceling the magazine! The worst part is you didn't even let anyone know! The $30.00 was for a year subscription! I got to download about ten magazines before the cancel. However all were taken away. I contacted iTunes and had to pretty much argue and prove my point that some people got refunds and many didn't. After going back and forth with three different people in iTunes I finally got my refund back! The first time you wanted $30.00 for the mag now you want $99.00? Maybe one mag had a little less info however I would never want to gamble on a company mag wanting $99.00 after what happened to me and others still without a refund. The smartest thing is to stay away from this company! Don't buy from them! They can cancel at anytime then good luck trying to get a refund! Another thing I thought I might mention is they don't even offer a monthly subscription! And another thing People magazine is expensive.... You might want to learn how they charge. Slow An Painful New App - No way to Renew!!!! What happened? It only tells you to subscribe, but not purchase past issues. I love the magazine in print, so I downloaded the app as well, and i simply love it. I love the clip functionality and its now so easy to get the photos from the app to Facebook.